Childish Gambino was awarded four Grammys including record of the year for “This Is America.” Unfortunately, he was not present to collect his awards. The 61st Grammy Awards was hosted by Alicia Keys on Feb.10 at the Staples Center in Los Angeles. Many artist were recognized in one of the 84 categories. Females dominated the ceremony, winning for the first time, and some even made history. Many women were awarded during the ceremony. Cardi B was the first female solo artist to win for be rap album “Invasion Of Privacy.” Not only was she the first woman, but it was her first Grammy of her career. 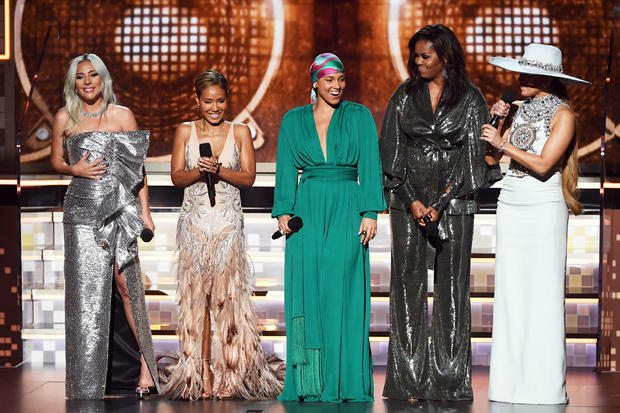 Kacey Musgrave won four awards including album of the year for “Golden Hour.” Ariana Grande won her first Grammy for best pop vocals for “Sweetener,” but was not present to collect her award. Women weren’t the only ones who were awarded, men such as Drake and Childish Gambino took home a Grammy award. Drake was awarded for best rap song “God’s Plan” and gave a speech about how people don’t need an award to know that they have won or to measure their success. The night progressed with many more awards. Dua Lipa won for best new artist and threw shade at Recording Academy President Neil Portnow after he criticized women last year saying they needed to step it up if they wanted more women to be nominated. Among the nominated, “This is America” (Childish Gambino) was the winner for record of the year and song of the year. Donald Glover made history at the Grammy awards despite not being there. Album of the year went to “Golden Hour” (Kacey Musgraves). The best score soundtrack for visual media went to “Black Panther.” The night was memorable for many artist who got the chance to leave their mark.